Henderson Middle School student earns national STEM honor. 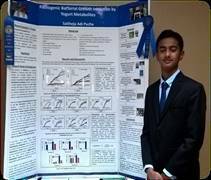 The Top 300 MASTERS hail from 236 middle schools in 39 states and represent 111 regional and state science fairs across the U.S. More than 2,499 middle school students participated. A panel of distinguished scientists, engineers, and educators evaluated the students based on creativity and originality of their science fair project, ability to engage in analysis of data, and understanding of STEM principles as they relate to the real world.